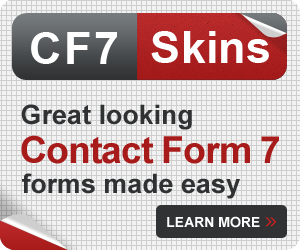 Contact Form 7 (CF7) is one of the most popular plugins available for WordPress. It allows users to quickly create customised forms, anywhere on a WordPress website. While the forms are easy to create and implement, the fields within them are styled minimally – allowing them to blend in with most websites. The appearance of each CF7 form depends on the CSS styling applied to standard HTML form elements used in your current WordPress theme. This article shows users, skilled at using HTML and CSS, how to style Contact Form 7 forms to their particular requirements. You will need to be skilled at using HTML and CSS to follow along in this article. If that description does not fit you, you can learn all you need to know about both HTML and CSS at http://www.w3schools.com/ and come back to this article when you’ve done that. You will also need to be skilled at using Firebug or Chrome Dev Tools to examine the HTML and CSS of your CF7 form in detail to follow along in this article. If that description does not fit you, you can learn about Firebug or Chrome Dev Tools and come back to this article when you’ve done that. We use the default CF7 form (normally named “Contact form 1” & installed automatically on every install of the CF7 plugin) as the basis of this article. The actual look of this default form on your WordPress website will depend on the current WordPress theme used on your website and the CSS styling that theme applies to standard HTML form elements. Tip: The appearance of the default CF7 form on your WordPress website will depend on the current WordPress theme used and the CSS styling that theme applies to standard HTML form elements. The Send button text is a little small. In this article we’ll be demonstrating how to change the style of this form, using HTML and CSS, to meet particular requirements. Forms are a common part of many websites and are a very powerful tool for interacting with users. They provide an easy way for visitors to your website to start a conversation with you about their particular requirements. While the CF7 plugin makes it quick and easy to create forms with little or no knowledge of HTML, Contact Form 7 forms are based firmly on the general HTML form process. HTML includes a number of elements which are specifically designed for use in forms. The CF7 plugin provides support for most of the commonly used HTML form elements, including some recently added HTML5 elements. and the CSS styling applied to these elements in your current WordPress theme. In any web form, the HTML provides the form content and layout (structure) of the form while the CSS controls the forms appearance and presentation (style). CSS – form appearance and presentation (style). The HTML in each CF7 form is created by the CF7 plugin based on information supplied by you in the Form section on the CF7 interface. Any HTML elements added by you in the Form section on the CF7 interface are combined with HTML generated by the CF7 plugin. 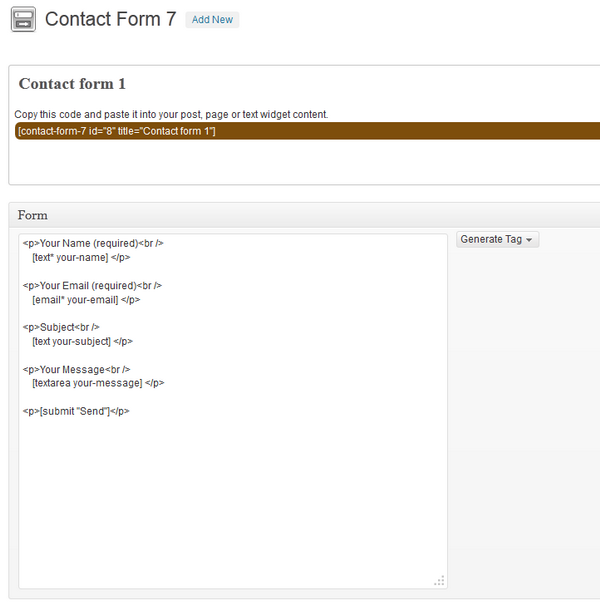 The default Contact Form 7 form uses label elements Label Content as the basis for the form. While this is probably the simpliest way to create a form, it has a number of shortcomings, which we discuss in further articles – ( see Why we use Fieldset, Legend & Lists in CF7 Skins and Making your form easy to read by using Fieldsets ). You can in fact use any HTML elements you want in the Form section on the CF7 interface and this is a key part of building CF7 forms that match your functional and appearance requirements. 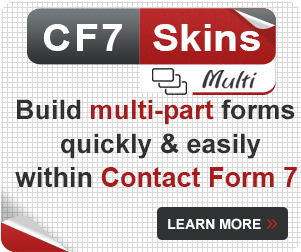 With practice you can learn how to create increasingly complex CF7 forms by combining your HTML elements with those added automatically by the CF7 plugin. The box below shows the content of the Form section of the CF7 interface for the default CF7 form. The standard HTML Elements you add in this section are output largely unchanged by the CF7 plugin. CF7 then uses the CF7 Tags to create fully functioning standard HTML form elements which can include a number of additional HTML attributes. 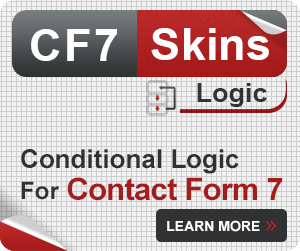 If you are not sure how Contact Form 7 uses CF7 Tags you can read all about them at Contact For 7 Tag Syntax. The box below shows the complete HTML code generated on the actual website, based on information supplied by you in the Form section on the CF7 interface and the additional HTML code added by the CF7 plugin. 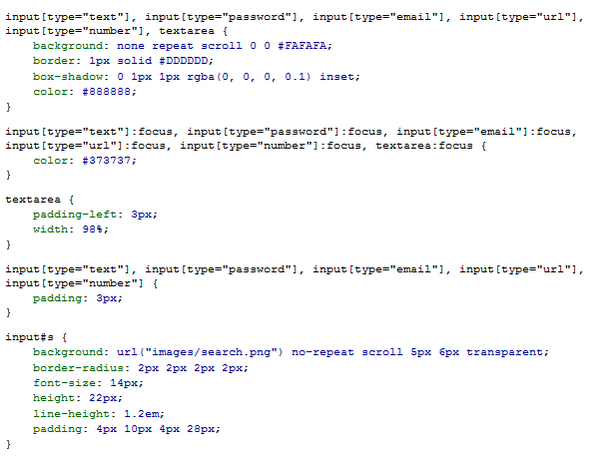 Take a moment to compare these two bits of code and notice where the information from the form section of the CF7 interface has made it into the HTML on the actual website. Tip: If you unable to understand easily what is going on in the code included in these two boxes, you probably don’t have adequate skills to change the style of CF7 forms, without at least some external support or advice. In that case you should continue to learn what you need to know about both HTML and CSS at http://www.w3schools.com/ and come back to this article when you’ve done that. These are added, by the plugin author, to allow users skilled at using HTML and CSS, to style their CF7 forms to their particular requirements. It makes sense to target these individual CSS classes available within your CF7 forms. WordPress theme developers also can use these CSS classes & ids to build support for the CF7 plugin within their theme. As CF7 is one of the most popular plugins in WordPress, it makes sense for theme developers to do this. You can also give your HTML form elements individual classes & ids within the CF7 tags in the Form section of the CF7 interface. This can be very useful when you have number of elements you want to style the same way. At this point you should use Firebug or Chrome Dev Tools to examine the HTML and CSS of your CF7 form in detail. Use one of these tools to explore all the HTML form elements in your CF7 form and see how each element is being styled in detail by the CSS in your current WordPress theme. In particular take note of the various style sheets that are contributing to the final style used and how individual style elements are being overwritten (or not) by the CSS hierarchy. Once you understand how the HTML and CSS is configured in your CF7 form, you can begin to plan the CSS changes you need to change the appearance of the form to suit your requirements. You will need to be skilled at using Firebug or Chrome Dev Tools to examine the HTML and CSS of your CF7 form in detail to follow along in this article. If that description does not fit you, you can learn about Firebug or Chrome Dev Tools and come back to this article when you’ve done that..
We used Firebug to produce the following diagram which shows the overall structure if the default CF7 form we are using in this article. 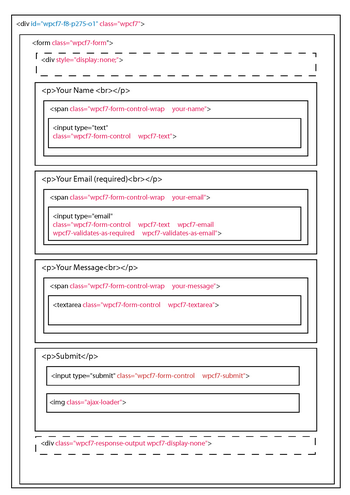 The diagram shows how each element of the form is created using standard HTML form elements and how those elements are arranged in relation to each other. With experience, using Firebug or Chrome Dev Tools should give you all the information you need to change the style of your CF7 forms quickly and easily, but it may definitely help you initially to produce a hand drawn paper sketch similar to this diagram. There is a common misconception that the CF7 plugin controls the appearance of CF7 forms though the plugins CSS style sheets. 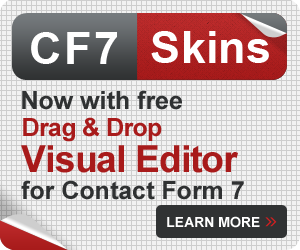 In truth the Contact Form 7 plugin uses only very minimal CSS styling to allow CF7 forms to blend in with most websites. For a listing of complete style sheet used by the CF7 plugin see Default CF7 CSS style. The appearance of CF7 forms on your website will depend largely on the current WordPress theme used and the CSS styling that theme applies to standard HTML form elements. Adjust the CSS used by your current theme for these HTML form elements. 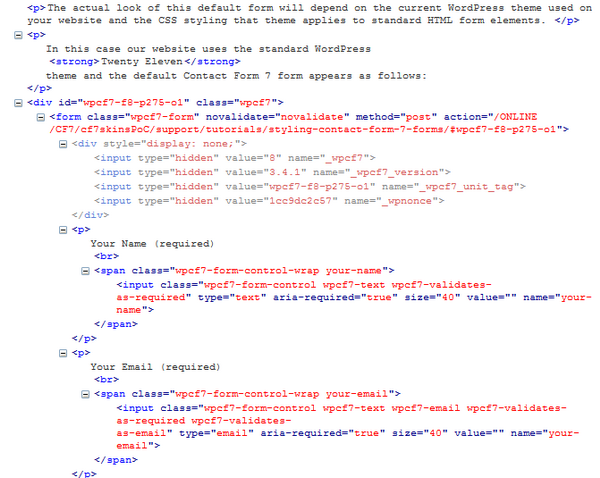 For some reason many WordPress themes do not provide CSS styling for standard HTML form elements. We regard this as poor practice and always look closely at how a theme styles standard HTML form elements when selecting themes. The most common and preferred method to makes changes to CF7 form styling is to create a Child Theme. Make any necessary additions to the CSS in the child themes style.css only, rather than directly in the themes styles.css. That way you don’t lose your changes when you update the theme. The style.css file of the child theme usually imports all styling from the parent theme by including the following CSS code at the top of the child theme’s style.css file. Any CSS changes that alter the appearance of our CF7 forms are added below this. Due to the CSS loading heirachy, any CSS changes made here will overwrite styles previously set in the parent theme. Alternatively you could use a custom CSS plugin to make your CSS changes. When making CSS changes you want to make sure that your CSS changes don’t inadvertantly effect other elements on your website. The preferred way to do this is to use CSS inheritance to target the relevant HTML elements within your CF7 forms only. Use CSS inheritance to ensure that your CSS changes don’t inadvertently affect other elements on your website. Depending on how your theme styles standard HTML form elements in general, and CF7 form elements in particular, you may need to add extra CSS specificity to get your CSS changes showing. For WordPress themes with high levels of unnecessary CSS specificity, you may need to target the #id of specfic CF7 forms as explained in Styling a Specific Contact Form 7 Form. You can add additional CSS styling to any CF7 form elements you want to modify. You can use Firebug or Chrome Dev Tools to explore the full range of ids & classes used by Contact Form 7. There are some CF7 classes available which you might want to use to target a specific CF7 Tag on all CF7 forms on your site. and then add alternative values for the properties you want to change. You can also add id and class attributes to a CF7 form by adding html_id and html_class attributes into a CF7 shortcode. This can be used to target individual forms via the html_id attribute or a number of forms using the html_class attribute. Using the techniques described in this article, we can use the following CSS to change the appearance of the default CF7 form. Using the changed CSS given above, the default CF7 form now looks as shown below. 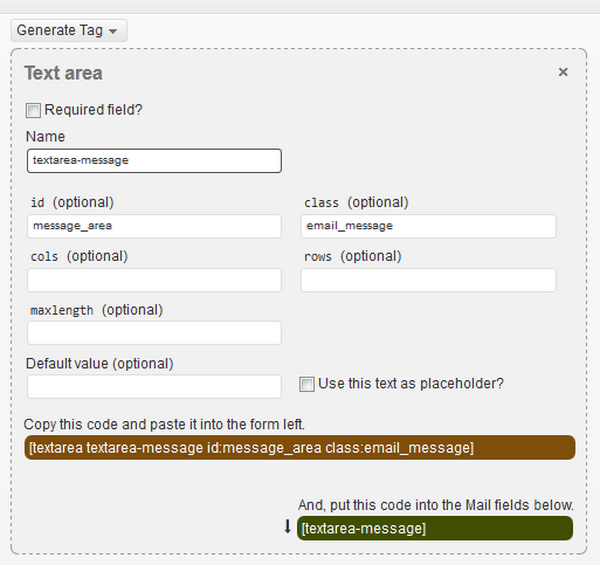 As practice you can use Firebug or Chrome Dev Tools to see how we’ve styled this form. 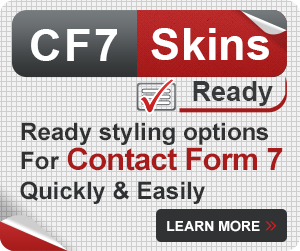 Each CF7 form has a unique id which can be targeted in your CSS changes – see Styling a Specific Contact Form 7 Form for detailed instructions on how to do this. If you still have questions, after reading and working through the information provided in this article , you should ask your question in the CF7 support forum. Please include a link to your Contact Form 7 form. This helps others to understand your actual problem and offer a possible solution. This form is made using CF7 Skins – you can use Firebug or Chrome Dev Tools to see how we’ve built it.